Mako robotic-arm assisted anterior total hip replacement surgery is cutting edge technology that provides each patient with a personalized surgical plan based on the unique anatomy of their hip. It has been developed in the United States and has been introduced to Australia. Dr Limbers is one of the first surgeons in Australia to use this technique. Total hip replacement is a procedure designed to relieve pain caused by joint degeneration due to osteoarthritis of the hip, by replacing the worn-out ball and socket joint with prosthetic components. Mako robotic technology provides Dr Limbers with a patient specific 3-D model to pre-plan your total hip replacement. During surgery, he guides the Mako robotic-arm based on your patient-specific plan. This allows him to remove only the diseased bone, preserving healthy bone and soft tissue, and assists him in positioning the implant based on your anatomy. Prior to surgery a CT scan of your hip is performed and is used to generate a 3D virtual model. 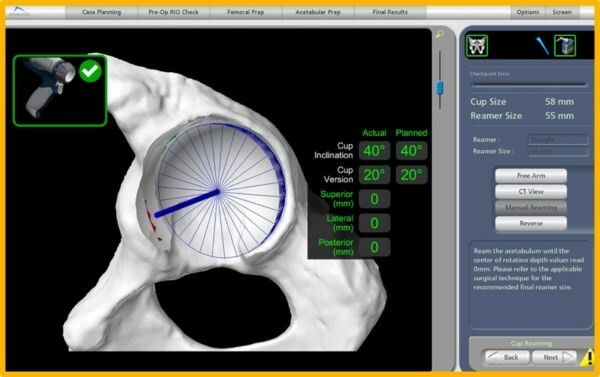 This virtual model is loaded into the Mako system software and is used to create your personalized pre-operative total hip replacement plan. In the operating room, Dr Limbers performs a minimally invasive anterior approach to your hip joint. This technique approaches the hip joint in an intermuscular plane, ensuring that no muscles are divided. This has been shown to have less pain in the first 6 weeks after surgery and accelerated rehabilitation, without the traditional post-operative hip precautions. He inserts navigation pins into the pelvic bone above the hip. He then maps the anatomy of your hip joint. All this information is detected by a specialised camera and passed to the Mako robotic unit. The surgical plan is then adjusted based on this additional information obtained during surgery. 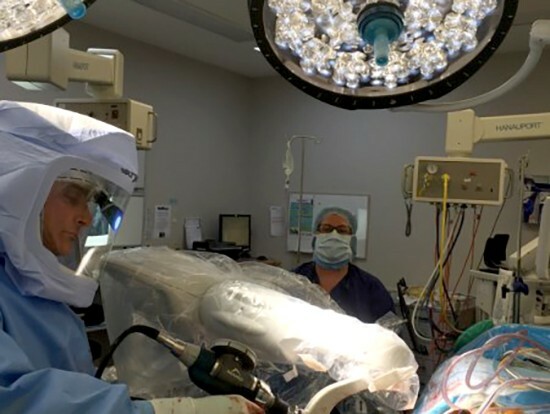 The robotic unit then guides Dr Limbers within the pre-defined area while he prepares the acetabulum (hip socket) and femur (thigh bone) to take the hip replacement components. After the bone preparation Dr Limbers implants the metal acetabulum and femoral components with a ceramic femoral head and a polyethylene or ceramic acetabular liner between the components. The tactile, auditory and visual feedback of the robotic arm limits the bone preparation to the diseased areas and allows real time adjustments. 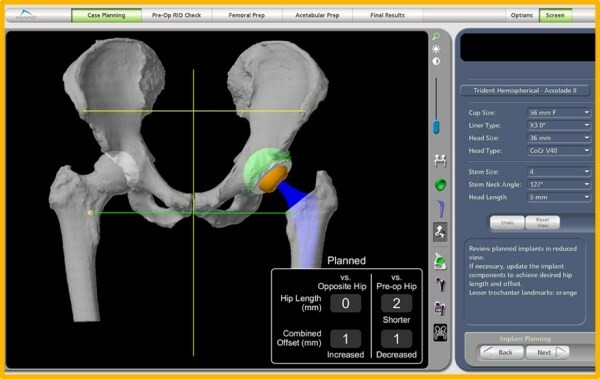 This technique provides highly accurate placement and alignment of the components of the total hip replacement. This potentially results in a lower incidence of leg length inequality and a reduced chance of post-operative hip dislocation. It has the potential to improve long term results of total hip replacement surgery, by ensuring optimal implant position. At the end of the procedure local anaesthetic is injected into the wound for pain relief. A local anaesthetic infusion catheter is also left in the wound to control pain. The wound is closed and covered with a waterproof dressing. Hospital stay is usually 3 – 4 days. After that you will be discharged home or to a rehabilitation hospital. Most of the recovery is achieved in the first 6 weeks, with improvement continuing over 3 to 6 months. There is no restriction in hip movements or sleeping position in the first 6 weeks after anterior total hip replacement surgery. Driving is allowed after 4 weeks. Is Robotic Joint Replacement Technology of Benefit to Patients? Robotic unicompartmental (partial) knee replacement surgery was the first robotic joint replacement platform to be developed. The rationale was that unicompartmental knee replacement could particularly benefit from the increased accuracy, given the higher failure rate of conventional unicompartmental knee replacement when compared to total knee replacement. Short term data of robotic partial knee replacement has been presented showing a lower incidence of premature failure, when compared to traditional instrumented partial knee replacement techniques. The acetabular cup placement was examined in robotically assisted and conventional total hip replacement surgery in a comparative study. A statistically significantly higher number (30% higher) of acetabular cups were positioned within the desired range of anteversion and inclination in the robotically assisted cases. Whether this translates into lower revision rates and increased patient satisfaction remains to proven. Thus, the early data for robotic unicompartmental knee replacement and robotic total hip replacement is encouraging.